Today we are linking up again with Andrea, Erika and Narci for Friday Favorites, and today we wanted to share some of our favorite outdoor toys. Warmer weather has arrived and longer brighter days mean more outdoor playtime. The amount of activities little ones can do outside is endless, but sometimes you hear those dreaded words we as moms can't stand to hear, "I'm bored!". Or even worse during the toddler years, before they can truly convey their feelings, the happy giggles turn into whirling tornadoes of destruction when their little minds and hands are no longer preoccupied to their satisfaction. This list of favorites are ones that we've noticed our kids both young and old have a ton of fun playing with, and that fun usually lasts for hours. 1. Melissa & Doug Sunny Patch Sprinkler - At the first hint of warm weather kids are often begging to go to the pool. Most pools don't open until Memorial Day, or sometimes just getting to the pool just seems like too large of a task with the 6,487 bags you have to bring. A sprinkler and a popsicle will usually do just the trick to keep everyone happy. 2. GBOP - Carrie Beth mentioned this large ball of fun her in-laws gave her children a few weeks ago. Trust us when we say ALL of our children (and maybe an adult or two) have loved playing with this. Even our littlest one hops right inside ready to be rolled around the yard. It has provided hours of entertainment and it is usually one of the first things the kids want to pull out to play with. 3. Splash Table - Splash tables are a great way for little ones to get some sensory play in without too much fuss. This Little Tykes Spiraling' Seas water table is the perfect size and a few different elements to allow for multiple little hands to enjoy the fun. Another favorite of ours is the Anchors Away Pirate Ship. 4. The Stomp Rocket - Who knew something so simple would provide hours of entertainment? One stomps, one chases, another stomps...its a win all around. This glow version is even fun for late evening playtime. 5. Tornado Bubble Machine - Blowing bubbles never gets old in this house. The littles can chase and pop them forever. A few months ago, I purchased this machine because let's be honest, mama was getting out of breathe. Best money ever spent! This machine produces a TON of bubbles and after months of wear and tear it hasn't even batted and eyelash or tried to low battery me once. It is definitely one of our favorite outdoor toys. 6. Sidewalk Chalk - A classic that always gets young children excited. A driveway or sidewalk is like a large canvas that can turn into anything from a pirate sword fighting scene to a friendly game of old school hopscotch. 7. Inflatable pool/waterslide - We remember loving to play with these as a kid and it hasn't changed much. This one is one of our favorites and easily accommodates a 5-6 year old. It also has some accessories that provide for extra entertainment. You can also go a little crazy with it and get one like this. Not gonna lie...mama might give that one a whirl or two. 8. Sandbox - Sand is usually a favorite amongst little ones. This Little Tikes Castle sandbox is not only adorable, but it is very functional. We love how the children can play and sit in it, but that it also comes with fun accessories to facilitate additional creative play. A huge plus is it also has built in storage compartments to place the accessories in when they aren't playing. The ramp portion also folds and serves as the top for quick cover and easy clean-up. How awesome is that? For your construction loving little one it comes in this Little Digger version. 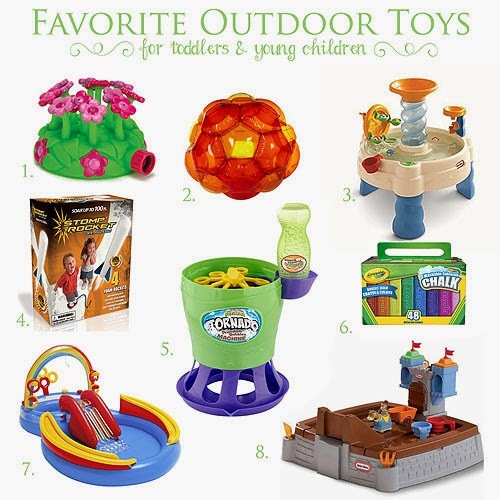 Do you have some favorite outdoor toys? Anything special items, or any games you've noticed your little one absolutely loves? Cory - same here! We are rarely inside and live at the pool! That is a good idea about the corn. I am going to have to log that for later when it cools off! Love this post and I most certainly have a toddler bc we are definitely in possession of most of these. I got some new ideas from this though so thanks ladies!